it's difficult to be both ill and gracious: it'd be nice to channel beth march from little women, but sometimes we're fated to be lucy westenra from dracula. i was doing pretty well until saturday, when i missed the two big parties of our holiday season (one of which began on a bus; o, vehicular parties!) in one fell swoop. joe put on workin' with the miles davis quintet just as i was feeling especially sorry for myself (i also missed yesterday's bust holiday craftacular, which featured animals for adoption this year), and i actually started crying with frustration. i really hate jazz. when i regained my manners, i got back to combing the web for clever presents (every day is cyber monday when you can't leave the house) and finishing our holiday cards. i communed with the cat and got started on handmade gifts, joe represented us on the bus, and decorum was restored. 09 one of my last pre-pestilence acts was a spin around midtown to ogle the holiday windows. 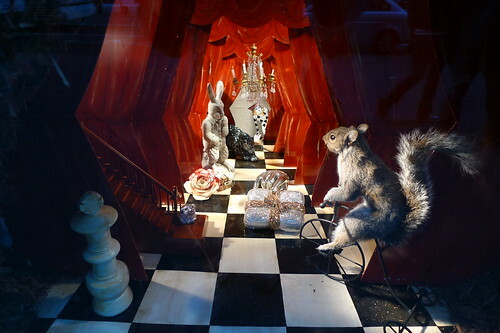 i have yet to make it up to bloomingdale's and barneys, but i have a feeling that the "compendium of curiosities" (read: alice in [couture and] wonderland) displays at bergdorf will remain my favorites. this mini-tableau in particular felt like lewis carroll via david lynch; very black lodge. 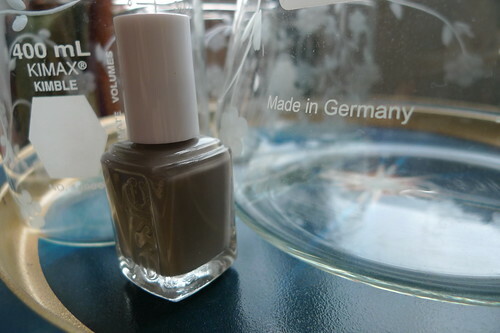 it's an essie color called chinchilly, it works on everyone, and it matches everything. it even elevates bedhead (or not, but pretend for me). you're welcome. I just tried to rock grey toes and they were TOO matchy. Turns out I wear a lot of faded grey/blue. I stripped it off and went back to black polish.